Sparkling silver rhinestones and seed beads decorate the neckline and shoulder strap of this adorable chiffon dress, letting you sparkle and shine at any event you attend. 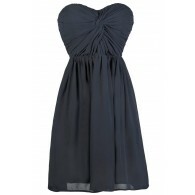 The Night Moves Embellished One Shoulder Dress is fully lined and made entirely of chiffon. It has one asymmetrical shoulder strap, an empire waist, and a flowy A-line skirt. Fabric ruching at the bust cinches to create an interesting effect and subtle pleating on the skirt gives it movement. The best part of this dress has to be the intricate beaded design at the neckline and strap. A hidden side zipper completes this dress. The Night Moves Embellished One Shoulder Dress would look great paired with pumps or strappy heels and a clutch. 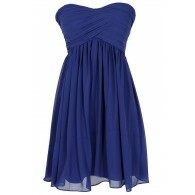 This dress is perfect for any upcoming dance or semi-formal event. Details: Fully lined. Hidden side zipper. Adjustable strap. 100% polyester. Hand wash cold water. Do not bleach. Do not tumble dry. Do not iron. Do not dry clean. Small measurements: Length from top of bust to hemline: 30”. Bust: 32”. You have added Night Moves Embellished One Shoulder Dress in Coral into Wishlist. You have added Night Moves Embellished One Shoulder Dress in Coral for Stock Notification. You have set Night Moves Embellished One Shoulder Dress in Coral as a loved product. 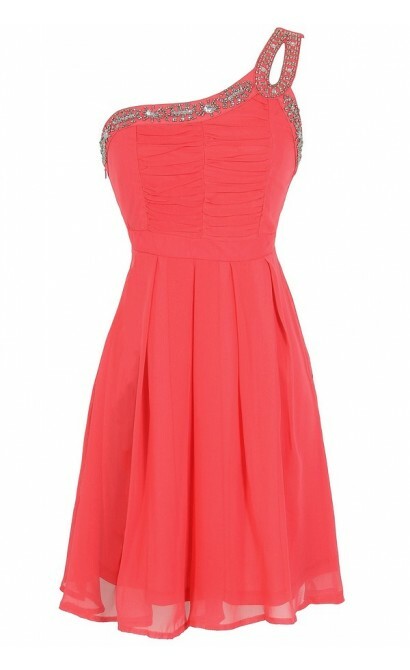 You have removed Night Moves Embellished One Shoulder Dress in Coral as a loved product.